Doctors usually perform an initial physical exam on patients they suspect may have the relatively rare form of cancer known as mesothelioma. It affects the mesothelium, the protective lining that covers many of the body’s internal organs, and is usually caused by exposure to asbestos. Imaging tests — These tests, which allow the doctor to see pictures of your body’s interior, may include an X-ray; a CAT scan; a PET scan, which uses glucose containing a radioactive substance to find the presence of cancer cells; or an MRI scan that uses radio waves and strong magnets instead of x-rays to get pictures. They might be done for a number of reasons, such as helping to find a potentially cancerous area, learning how far cancer has spread, and monitoring how well treatment is working. Blood tests — Levels of certain substances are often high in the blood of people with mesothelioma. But so far, blood tests have proven more useful in following the progress of people already diagnosed with mesothelioma during and after treatment. Tests of fluid and tissue samples — To make a diagnosis of mesothelioma, the doctor removes cells from an abnormal area and sends them to be looked at under a microscope. Pulmonary function tests — These may be done after the cancer is found to see how well the lungs are working. 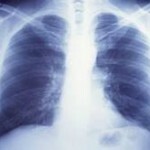 Determining lung function is a crucial step in advance of surgery to take out part or all of a lung.